Classical, Blitz, or Reverse QFD... Which one for my project? Classical QFD, Blitz QFD®, or Reverse QFD... Which one for my project? "Your web site mentions Classical House of Quality, Reverse QFD, and Modern Blitz QFD®... How do I choose which one to use for my project? Can they be combined, for example Reverse QFD plus Classical House of Quality?" "I thought a House of Quality provides more details than Blitz QFD®, so we should always make a HoQ matrix in order to do QFD. But you mention that the Maximum Value Table can do the same analysis faster and easier without any drawbacks. How so?" We thank our readers for emailing these important questions. Let us recap the different approaches and help you decide an optimum path for your next QFD project. Classical QFD has two types. Classical Comprehensive QFD, developed in Japan in the 1960s by QFD founders Yoji Akao and Shigeru Mizuno. Comprehensive QFD looks at the full process of new product development quality from two perspectives: product quality and process quality. Product quality is sub-divided into major deployment categories such as quality, technology, cost, and reliability. Each deployment category uses tools such matrices (house), hierarchy and affinity diagrams, prioritization, tables, and competitive benchmarking. One of the many matrices in quality deployment is the House of Quality (HoQ). Process quality focuses on the cross-functional communication process within the organization to assure that voice of customer and priorities are accurately transferred through the departments responsible for new product development, such as marketing, engineering, manufacturing, software, service, quality, supply chain, production, etc. Strengthened the voice of customer analysis by adding qualitative "customer gemba" analytic tools and quantitative "big data" analytic tools; Added new deployment categories for security, environment, and other modern concerns, and more. Again, a critical update to be aware of: The new ISO 16355 standard specifies that you should use modern mathematics with ratio scale numbers instead of ordinal scale numbers even if you still use the 4-Phase approach. Blitz QFD® was created by the U.S. QFD Institute to address the trend towards Lean Thinking and Agile Development. In many modern organizations, there is not enough time, people, or money to do everything to the complete extent, so there must be prioritization to identify what should be done first and best. Since most new product development projects are incremental improvements, it may be possible to re-use much of the existing design and only make improvements where there is an important and unfulfilled customer need. When customers are asked to prioritize their needs, it is usually the case where there are only a few needs (2-5) that are both important and unfulfilled. With only a few needs to deploy, Blitz QFD® makes it possible to do Comprehensive QFD on ONLY those needs by using a concise table rather than matrices. This makes the work "lightening fast" (hence the name 'blitz'), compared to many, many big matrices such as a HoQ. Not only that, Blitz QFD® can precede Comprehensive QFD with no waste of time or effort. This is because all the information in the Blitz QFD® Maximum Value table (MVT) will be the same as the high priority information in every Comprehensive QFD matrix. 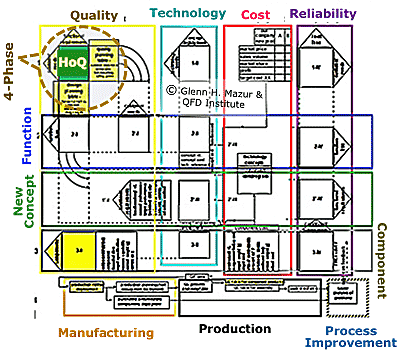 In comparison, House of Quality may contain detailed elements but it actually addresses only a small corner (the green box) of the entire QFD new product development process, as shown in this diagram. This is the reason why we always recommend to do Blitz QFD® first in order to begin detailed design of the new product, and then do Comprehensive QFD matrices when necessary and when there is adequate time to complete them. Most product development projects begin with market demand. However, it is often the case where internal or external stakeholders can initiate the project. In these case, reverse QFD is recommended. Reverse QFD can be done with Comprehensive QFD or Blitz QFD®. Here are some examples. Technology-driven QFD. A company develops a new technology, material, process, software, service, etc. either through R&D or acquisition of a technology company. There is no customer demand for this technology yet, because it is new and unknown. It is possible that the new technology has little positive impact on strong and unfulfilled customer needs, and thus the customer does not buy it. This results in a market failure. For example, many years ago, the U.S. General Motors (GM) purchased a technology company called Hughes Aircraft. Among the Hughes technologies was "head-up" displays used in fighter jets to display targeting and operational data on the front canopy. In 1988, GM introduced this technology in its Oldsmobile brand (now defunct). Due to low demand, it was stopped until re-appearing in 2003 in the Cadillac brand. Reverse QFD can be used to identify appropriate customer segments and when to introduce the technology to satisfy their important, unfulfilled needs. Regulatory-driven QFD. A governmental or other authoritative body changes a regulation. The company must adjust its design, materials, process, software, etc. to the new regulation without a negative impact on the customer. For example, in the 1970s it was discovered that CFC, a common refrigerant and aerosol propellant, was destroying the ozone layer of the Earth's atmosphere. CFCs were then banned. A hairspray company had to replace the CFC propellant in their product but was concerned about interactions with the adhesive resin which was the active ingredient in the hairspray. Manufacturing-driven QFD. Relocating manufacturing operations has both cost-saving benefits and quality risks. This can be due to climate, worker education, local sourcing of materials, shipping conditions, etc. Reverse QFD can help identify the impact on customer satisfaction due to changes in manufacturing location and processes. Cost-driven QFD. There is a demand to suppliers to lower cost. Reverse QFD can help identify where products are over-engineered and costs can be cut without negatively impacting customer or consumer satisfaction. Reverse QFD can also help estimate the impact on sales and profits if cost-cutting does reduce customer satisfaction. Competitor-driven QFD. A competitor introduces a new technology or feature. The sales department demands that we must have the same thing or we will lose business. Is this true? Is it possible the competitor is making a mistake such as the head-up display or new UV curing device mentioned above? Reverse QFD can help identify which sales and product strategies make the most sense. Purpose of the House of Quality (HoQ) and other matrices. Essentially, both the QFD matrix and the Blitz QFD® Maximum Value table (MVT) are "effect-to-cause" fishbone diagrams that indicate which "bones" have relationships with which "heads" and how strong is the relationship. 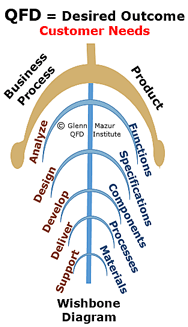 QFD wishbone diagram In the House of Quality matrix, the "bones" are functional capabilities and non-functional performance characteristics of the product, and the "heads" are product-independent customer needs. In the Maximum Value table only the strong relationship bones of the high priority customer needs are included. The purpose of both the HoQ and MVT is to help product developers focus and align their design efforts on what matters most to customers. When design engineers face constraints in time, money, and resources, they must prioritize their efforts so that they focus on what will satisfy the target customers and create the most sales and profit. By doing Blitz QFD®, they can focus their effort immediately. If they start with HoQ, however, the focusing cannot begin until the entire HoQ matrix is completed. In some projects, the HoQ can have 1000 rows x 1000 columns = 1,000,000 relationships to examine and quantify. This could take years to complete! By the time you finally get to the analysis, you might be facing a very different market. That does not serve modern business. 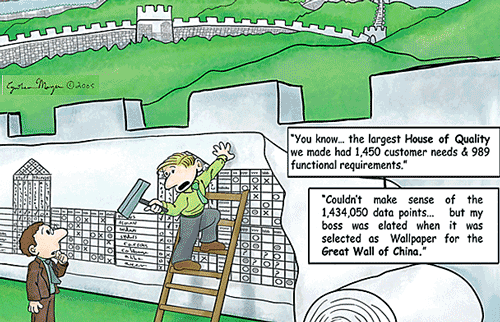 Furthermore, the HoQ is only the first of several matrices that must be done in Classical QFD and 4-Phase QFD, and you may find that 95% of the customer needs and functional/non-functional requirements identified in HoQ are too low priority to assign engineering resources or budget to improve. Begin with HoQ and wait until it is finished to start design on only 5% of what you analyzed (waste of time). Lastly, whether you are using Classical House of Quality, Reverse QFD, or Modern Blitz QFD®, remember that Voice of Customer (VoC) and Voice of Engineer (VoE) must be translated back into product-independent customer needs. This will assure your QFD analysis is clean and consistent, resulting in more efficient team work, better documentation, and of course, more satisfying products and services. Also, be sure to use updated math as specified in the ISO 16355. If you use pre-ISO math such as 1-3-9 prioritization ratings, both your execution and analytic outcome are questionable. We hope this explanation will help you decide. Please let us know if you have more questions or consider attending the QFD Green Belt® certificate course to lead your project in the right direction the first time and put your resources at the optimum use. © Glenn Mazur / QFD Institute. Is your House of Quality obsolete?